Yay! Competitions! So what's new? Have you noticed? We've posted new competitions for you to enter! This week is mostly a back to school theme as most of us have returned to school, college and university. Or maybe, you don't carrot all about going back to school, and would rather look at big vegetables with @James; Click here ! 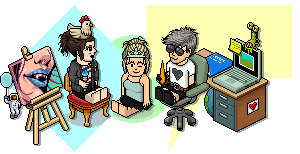 Maybe you'd rather just think about habbo in @TinyFroggy;'s competition... Click here! @Samantha; won last week's "Trading Off" competition. The prize was 10c and VIP, but Samantha kindly donated her VIP prize to @Danny;! @Cadigyna; has won "New to the scene" today, and has won a pixel poo and a yellow bear! We'll contact you shortly. Well done! I hope you all enter our new competitions. Good luck!